Stockholm, Sweden, Hannover, Germany-March 1, 2011-Tobii Technology today unveiled the world's first laptop with integrated eye control. The prototype laptop has been developed in collaboration with computer manufacturer Lenovo and will be shown publicly for the first time at CeBIT in Hannover, March 1-5. Lenovo, the world's fourth largest manufacturer of personal computers, has built the world's first eye-controlled laptop, using eye tracking technology from Tobii. The laptop is a fully functional conceptual prototype and an important breakthrough for Tobii in its mission to bring its eye tracking technology to serial production and consumer products. Most computer manufacturer's today endeavor to enhance their products by adding more and more natural interfaces. Using our eyes to point, select and scroll is completely intuitive and complements traditional control interfaces, such as the mouse and keyboard, in a very natural way. "More than anything else, the Tobii laptop prototype is proof that our eye tracking technology is mature enough to be used in standard computer interfaces. To reach a state where the technology is part of the average computer, we need to make it smaller and cheaper. We believe that this can be realized in a couple of years by partnering with the right manufacturer," comments Henrik Eskilsson, CEO of Tobii Technology. The first batch of eye-controlled laptops consists of 20 units split evenly between Tobii Technology and Lenovo for development and demo purposes. "On the one hand, we have Lenovo, a great partner, representing industry-leading expertise in computer manufacturing and hardware development. Tobii, on the other hand, has the world's leading eye tracking technology and unique expertise in eye tracking and eye control interfaces. We are very happy with the outcome of this collaboration," Henrik Eskilsson concluded. For users, eye control is thrilling and makes the computer interaction more effective. 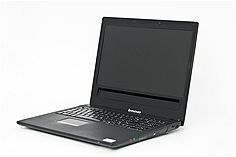 It is as if the computer understands you; just glance at an icon or gadget and more information will be presented; You can zoom pictures or maps and automatically center on the area you are looking at; The computer can auto-dim and brighten the screen when it recognises your eyes to increase battery time. Eye control can also speed things up by enabling new and intuitive ways to switch between open windows, and browse your emails and documents. "We anticipate that people will be extremely excited to be able to control their computer with their eyes," said Barbara Barclay, general manager of Tobii North America. "But what we find most exciting are the opportunities that eye control as part of multi-modal interfaces offer consumer electronics manufacturers in a range of product categories. We look forward to working with our partners to find many exciting ways to share and integrate this technology to advance their work." For a live presentation at CeBIT March 1-5, please visit our booth C13, Hall 9. Tobii Technology is the world's leading vendor of eye tracking and eye control, a technology that makes it possible for computers to know exactly where users are looking. Our eye tracking technology has revolutionized research in many fields and enabled communication for thousands of people with special needs. Looking forward Tobii's mission is to bring eye tracking into broader use. Some of that future is already here. We provide market-leading eye tracking technology to industrial partners in areas such as hospitals, diagnostics, vehicle safety, gaming and computer manufacturing. Tobii continues to realize its visions, showing continuous and rapid year-to-year revenue growth, and receiving numerous awards and recognition for its accomplishments. From our head office in Stockholm, Sweden, our reach is as broad as our vision. With offices in the US, Germany, Norway, Japan and China and a worldwide network of resellers and partners, we are truly a global company.